Since there were some questions on how to handle students' enrollment in special programs for ADA reporting (for example, Home/Hospital, Independent Study, Secondary Enrollment - No ADA etc. ), we wanted to send along a quick tutorial on how to process these changes. Since the Monthly Attendance ADA report automatically handles the calculations surrounding student enrollment, students records just need to be updated to note when a special program relevant to ADA starts and ends for a particular student. Here's the process on how to manage this when students start and complete special program. Go to Students and find the student record. Scroll to the bottom of the record to the information tabs section, and chose "Programs". 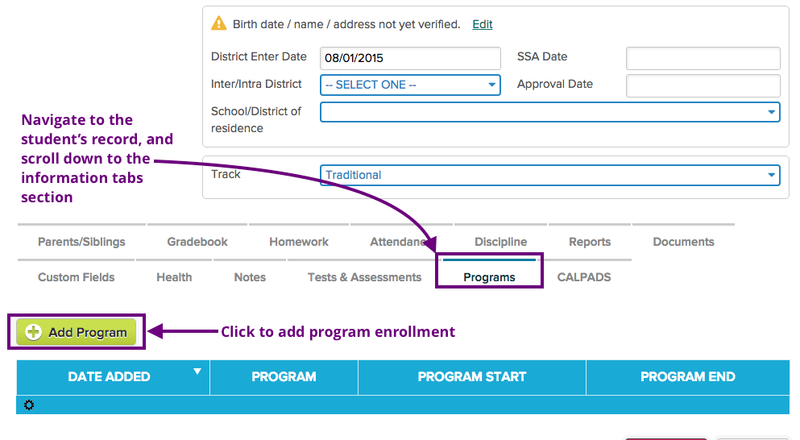 Navigate to the "Programs" section of a student record to enroll that student in a special program. Click "Add Program" and fill out the Programs dialog with program start information. Select the appropriate special program from the dropdown. This process is the same for programs that have no impact on Attendance, such as Foster Family, Homeless, and Migrant Programs. Add information for the student's starting the program. The most critical dates are the Program Start and Program End dates, if known. Eligibility start and end dates are purely informational. Additional info can be tracked as a comment. Save the new program. It will be visible on the student listing. Once the program is saved, it will appear in the student's record. Students may have multiple active and inactive programs that appear here. 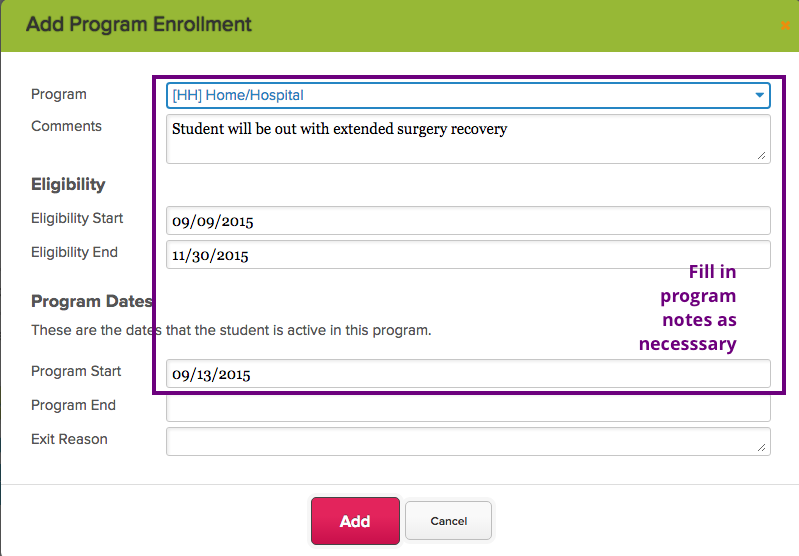 When the student completes the program, navigate back to the program record and update the end date information. The best practice is to maintain the program's current status as the student is enrolled (discussion is a key feature here). 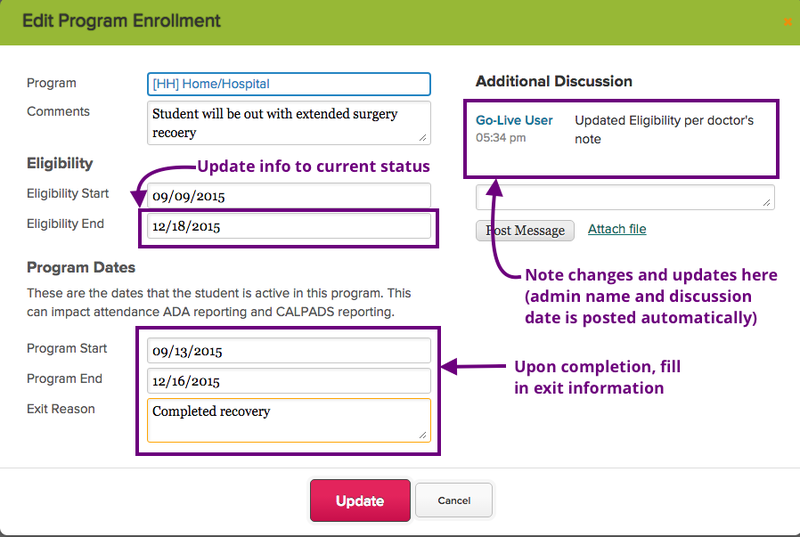 When the student completed the program, update the exact exit date and any additional information that's needed. In addition, if your school has dual enrollment, be sure to use the "Secondary Enrollment - no ADA" program to remove students whose home school is not your own, to prevent them from being counted for your school. One thing to note: You do not have to un-enroll or re-enroll a student into the school when a student enters or exits an attendance program. For example, once a student completes Independent Study, the software automatically returns the student to regular program status. However, if the student is adding/dropping different sections, that will still have to be done of course. 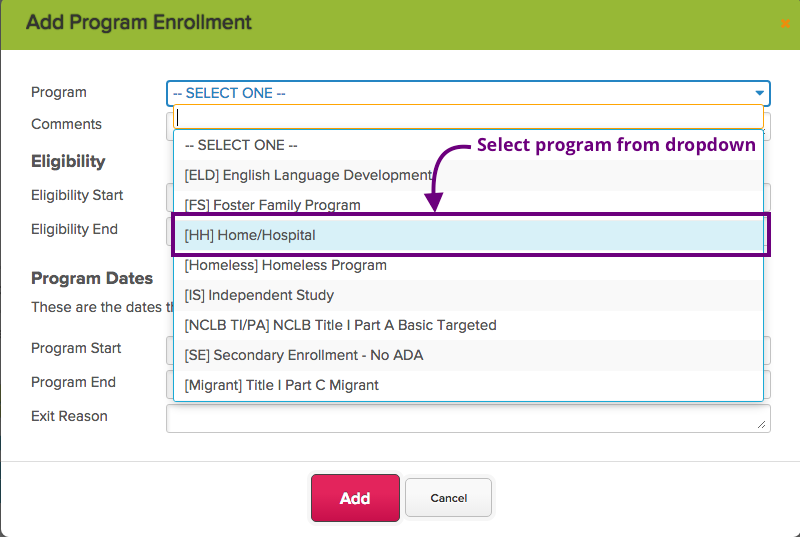 While we focused on attendance programs, the Programs tab also is for tracking other special programs and statuses such as English Language Development, and special residency statuses. Hopefully, this helps clarify the Programs section and as well as how to maintain student records while students are enrolled in a special program. Of course, if you have any questions, please feel free to contact us any time.